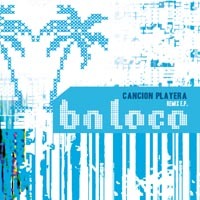 Limited edition CD-R "Cancion Playera Remix EP" by BN Loco. The standout track from his debut album “Echo En Mexico” on Sonic360, Cancion Playera has been remixed by producer friends of BN LOCO (aka Uriel Esquenazi). Rosco, the production team from Mexico City, creates a lovely tropical beach town sunset vibe, Sistema Local, the Monterrey Sound System dubs it up with some dusty border town beats, Latinsizer (Electronic project from Pepe Mogt from the Nortec Collective) hammers out a perfectly balanced uplifting dancefloor hit and as a bonus, Mexican producer Almeyda turns to the track ‘Buen Ambiente’ to conjur up a dark driving euphoric anthem! The Cancion Playera Remix EP gives you a rare glimpse of the future electronic sounds coming from Mexico! Exclusively available to buy here on the Sonic360 shop!